to give reassurance to athletes about the safety of our products. Osato International Inc. is proud to announce that Immun'Âge was certified by global anti-doping laboratory in UK with its programs: Informed-Sport and Informed Choice, so that world top athletes can take Immun'Age without worry. Immun'Âge (FPP: Fermented Papaya Preparation) is produced by the factory certified with ISO9001, 14001, 22000 and FSSC22000 under strict quality control, realizing a stable and high quality production highly regarded both in Japan and abroad. Immun'Âge has been an official partner of Aston Martin Racing since2005 and loved by its racing team members for their health maintenance before, during and after the endurance races such as Le Mans 24 Hours. Not only drivers in motor sports, Immun'Âge has been supporting athletes in many fields such as golf, full-marathon, bike road race, ski, motocross bike and built up a reputation and trust with them. ■Collaboration with Rugby team "Combined Services Barbarians"
Immun'Âge has been involved with a rugby union team "Combined Services Barbarians (CSB)" of predominantly current members of Royal Marines as its founding patron. They will play 6 games each year to raise funds for charities that directly help current and former service personnel suffering mental injury such as PTSD（Post Traumatic Stress Disorder）and their families. In UK, rugby players cannot use supplement if it is not certified with anti-doping program, so they asked us to get Immun'Âge certified with it so that they can take care of their health using Immun'Âge. Therefore, we started working on it last year, and Immun'Âge has been certified by the world class sports anti-doping laboratory, LGC in UK. 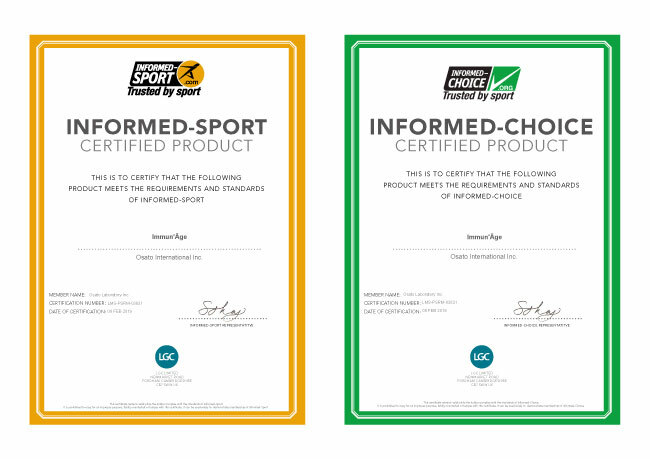 It is an internationally recognized quality assurance program for sports nutrition products, which certifies that all nutritional supplements and/or ingredients that bear the logo have been tested for banned substances, defined by WADA 2018 Prohibited List, by LGC, a world-renowned sports doping control and research laboratory, with over 50 years of expertise in anti-doping in sport. It is an open and transparent anti-doping program to ensure that regular batch testing and/or blind sample testing is carried out to show the results on their website to ensure the products in the market are safer for athletes to use. The certification process requires not only both product testing but also a manufacturing quality system audit including evaluation of ingredients and production site to ensure there is little risk of contamination in the finished product. Providing safe food products for top athletes who always need to keep their top condition to push their own boundaries can contribute to food safety so that it can be taken by any person, including children and elders without worry. Now we are also planning a project to support children who play sports. Osato International Inc. will continue to provide safe and secure products under more advanced risk management.